hailey is using Smore newsletters to spread the word online. 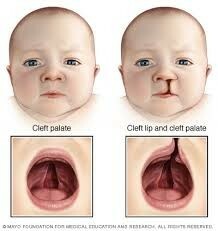 A cleft palate is a split or opening in the roof of the mouth that occurs within the first three months of pregnancy. Testing: usually seen at birth but in some cases it has been seen in an ultra sound. complications: Because of the cleft palate people have hearing problems. they are most likely to get ear aches, and in some cases they have permanet hearing loss. "Cleft Lip and Cleft Palate." American Speech-Language-Hearing Association, 1997. Web. 13 Oct. 2015. "Birth Defects." Facts about Cleft Lip and Cleft Palate. CDC, 20 Oct. 2014. Web. 13 Oct. 2015.